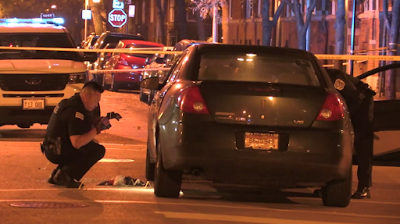 Almost exactly 24 hours after a shooting Saturday evening that was undoubtedly gang-related, another shooting took place Sunday. This time the motive is more puzzling, since the victim is non-gang-affiliated, or a "civilian," as many readers have told us. Shortly before 9pm, Gregory Dion Tuck Jr., the driver of a black sedan, was shot in the head as he drove southbound on Hazel. The shooting took place at the intersection of Windsor. He was 25 years old and lived on the 4800 block of Winthrop. Witnesses tell us a silver car pulled up next to the black sedan and 5-6 shots were fired. Neighbors report hearing screaming, followed by the arrival of police squads and EMTs. Mr. Tuck was taken to Illinois Masonic by ambulance, which left the crime scene at breakneck speed. As of midnight, the intersection was still blocked off with crime scene tape, and police officers were still investigating. The Tribune reports that Mr. Tuck arrived at Masonic in critical condition. We will provide updates as we become aware of them. Update: Shortly before 3pm on Monday, there was official confirmation of his identity and his death. We had seen unofficial mentions beginning an hour after the shooting, but we didn't want to post until we knew for a fact that his family had been notified. "I just would like to inform you about Greg Tucker Jr. I've known him from the day he was born. He was a good kid, he loved basketball, and he was not in any way associated or affiliated with any gang! The people that took his life were most definitely involved in gangs. He played basketball for Lincolnwood High School. After graduation, he attended college out of state. He was a great young man." "The victim killed in the recent Uptown shooting was a stand out basketball player at Whitney Young and Lincoln Park high school and went on to play and graduate from college. He had recently had a daughter whom he loved dearly." "Greg Tuck Jr. was not in a gang and was a great kid." Our deepest condolences to those who lost a friend, relative and role model. We hope his murderer(s) are found. May his memory be a blessing that lives on. No wonder there is no money left in the budget to house the homeless. I have an idea. Let's kick out all the drug dealers and gangs living illegally in Uptown's low income housing units and use those units to house the homeless. Oops! My bad. I almost forgot that the career activists who run the Tent City movement are the same career activists who are affiliated with the pro-bono (taxpayer subsidized) law firms that represent the bad guys when attempts are made to evict the off-lease gangbangers and their families that illegally house them. They also initiate the police brutality cases against local police whenever the police put pressure on the gang activity. Criminals and prisoners have rights that must be protected at any and all cost to the neighborhood and taxpayers, you know! "Go Fund" that. Keep your mouth shut if you don't know the particulars. This young Man grew up in my Rec programs . He had a job, was planning for the future and a good father. He was just giving someone a ride. It cost him his life We We were just chatting this summer about life and the future. You aren't apart of the solution . I normally don't respond to comments but you will not slander his good character Those who do wrong should and will pay for their atrocities Mr. Dixon is not that person. So, I can presume you are with me in wanting to get the gang bangers who shot him out of our community? And I can presume you agree that gang shootings waste lives and dollars that could be used more productively? Regardless of whether he is or is not a gang banger, aren't we all, especially your friend, paying a huge price in putting up with gangs housed illegally in this community. especially when they commit such horrible, violent crimes?. What do you proposed to end it so that someone else you know does not become the next victim? 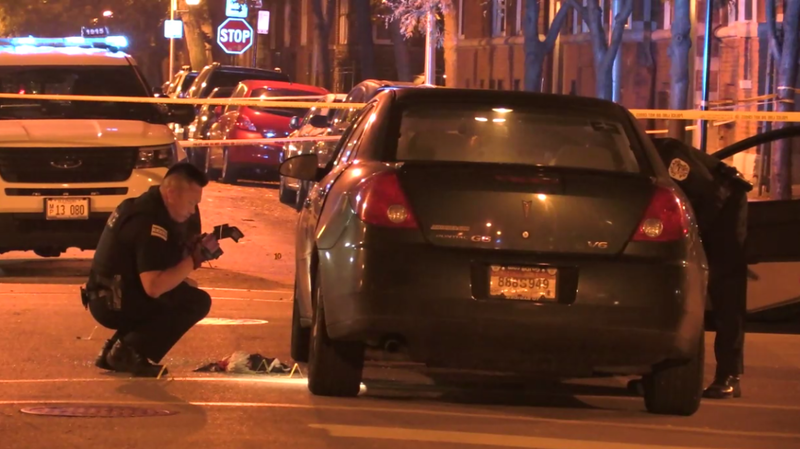 Did you notice that the victim's car in the photo is sporting "temp plates"? Why am I not surprised? They generally do when they are about to be used for something illegal. That is an ignorant comment. My plates are temporary, but i work and am about to be a student. Don't do drugs. So what does that say about your comment? You're basically saying that he got that car to plan his own death? Huh? No! Think before you speak. Too bad it wasn't. The victim wasn't in a gang at all. He just plays basketball and goes to college. Greg Dion Tucker Jr.. That his name. Go look at his facebook and see that he didn't live this gang life. To uptown girl. This was a boyfriend, a father, a victim of a senseless shooting. Do you not know temp plates are issued when you purchase a car. What an assonine comment. This is a close friend of mine. Think before you speak. You obviously dont live this everyday. So STFU! Your comment is pathetic. Yes I said it. Pathetic. I'm not saying that everyone with temp plates is involved in crime. I am saying that criminals and gang bangers involved in crimes very often sport temp plates when they are involved in crimes. Now, how would I know? I've had two stolen cars, both were used in crimes and found with temp plates instead of my plate. And I had to testify against the drug-dealing, chop-shop-running weapons-dealer-out-on-parole gang leader and put him back in jail for 8 years. He was running a car theft ring in Uptown highrises using valet parkers affiliated with his organization. So, my comment is based on personal experience. And, yes, I've had temp plates on a new car too. But I was not involved in a shooting at the time and I bet neither were you. Repeat. I'm not saying that everyone with temp plates is a criminal. I am saying that very often persons involved in crimes use temp plates. Too bad this article ain't nothing but a damn lie. Somebody died because idiots with guns wanna go out and shoot people. This so called "gang member" that got shot wasn't in a gang. As a matter of fact, he hatrd gangs just as much as I do. This so called "gang member" went to college and played basketball and tried to be something. This so called "gang member" was a very good man wkth a daughter. This do called "gang member" is Greg Tucker Jr.. I looked up to when I was younger. To say that a good guy like him was in a damn gang pisses me off. That like saying I'm part of a gang when I hate them. Thisc shooting was not gang related. Greg stayed happy and loved what he was doing and where he was going. You are absolutely right. I have reached out and found mutual friends who also knew him. 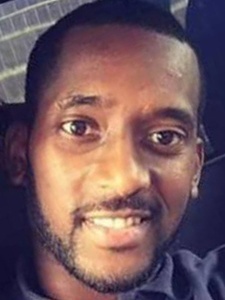 They say he was in the neighborhood regularly because he played basketball at Clarendon Park field house just two blocks away from the shooting scene. I jumped too soon to a conclusion and I own my mistake and apologize. I still think that the temp plates might answer the question as to why he - of all people - seems to have been targeted by that one shot to the head. It is not like he was walking down the street and took a hit in a stream of gunfire as they shot at someone else. We, in this neighborhood, are all bracing for the inevitable retaliation hit for the shooting that occurred just days before this shooting. He might have looked like someone from the rival gang and the temp plates on his vehicle might have been all it took for the shooter to presume that he was there for a shooting and quick get-away, In other words, the shooter may have made the same ignorant presumption that I made. Anyway, I am very sorry for your loss and any additional pain that I may have cause you. BTW, there were shots fired near that Clarendon Park area again last night at 11:30. Wow just reading the mean evil comments from one person is sad! I saw this young man laying in the stree dead! O my god! This was a life taken! and for what!? All people who are black or live in low income homes or smh have temp plates are not gangbums! You should have done your "research" b4 you disrespected him and his family & friends! May god hold his family and friends throughout this trying time! I pray for peace to those who know not what they say or do! I pray that this young man can rest in heaven! And that justice will come to his family. Nothing was ever said about any assumption regarding the color of his skin or his income level. You are adding that evil to the story. Let's stop this and act peaceful. I'll pray too. Uptown girl....You're stuck on the temp plates. It had nothing to do with that. There were 5-6 shots fired. All intended for the passenger in the car, who Gregory we giving a ride home to. They began shooting as the passenger got out of the car and hit Greg. Simple as that.